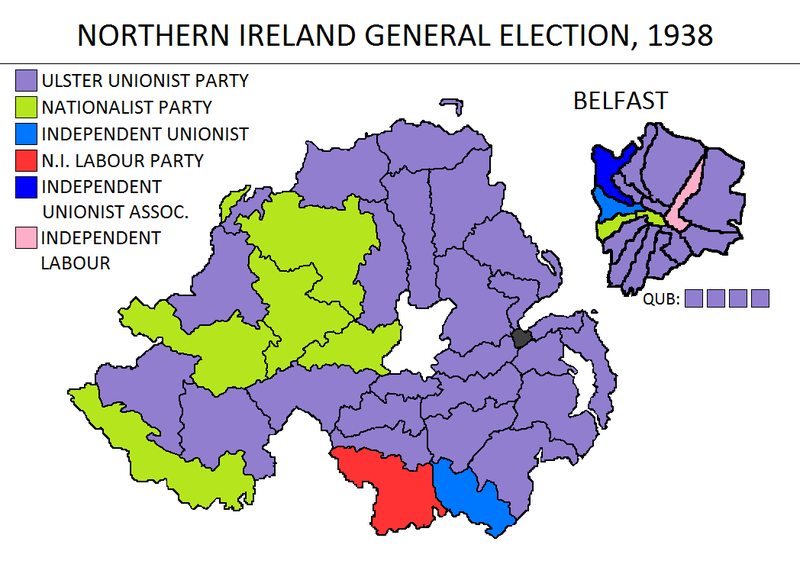 The heavily gerrymandered constituencies of Northern Ireland in the first few decades after its inception did not lend themselves to much fluctation in general elections. Many of the unionist-dominated constituencies saw Ulster Unionist candidates running unopposed in several successive elections. The UUP could always be sure of a large majority in the Stormont parliament, while nationalists and other groups flounded with minimal representation. The Nationalist Party was faring so poorly that by 1937 only two of its nine MPs regularly attended parliament. The general election held in 1938 saw no change to this scenario. Although the UUP did come under threat, it was from other unionists groups, not nationalists. Two groups opposed the UUP over their economic policy: the Ulster Progressive Unionist Association, made up of former UUP members, and the Independent Unionist Association, an alliance of independent unionist MPs and candidates who ran on a platform of combating unemployment. Despite the presence of these two new unionist groups, several unionist individuals still chose to run as independents. In total, 66 unionist candidates ran in this election for the 52 seats in the Stormont House of Commons. The Nationalist Party, meanwhile, knew it was defeated before the election even began. It chose to boycott several constituencies, running just nine candidates in total. The Northern Ireland Labour Party chose to run seven, an increase of four on the last election. Former Labour member Jack Beattie ran as an independent Labour candidate in Belfast Pottinger, while three other "independent" candidates put their names forward also. Click here to learn about the constituencies used in this election. The election was a resounding success for the UUP, which managed to increase its seat total by 3. The Nationalist Party was reduced to 8 seats from 9, with their representation in South Down taken by the Labour Party. Fianna Fáil's South Down seat, which they did not contest, was taken by independent unionist James Brown. Beattie took Labour's seat in Pottinger, meaning that the NI Labour Party found itself with just one seat. Their leader, Harry Midgely, lost his seat in Belfast Dock. The Independent Unionist Association took one seat, with incumbent MP Tommy Hendersen retaining his seat for his new party. The UPUA failed to win any seats, and was dissolved after their subsequent failure in the 1943 Antrim by-election. The UUP duly continued as the government of Northern Ireland. It was indeed "business as usual".